I have to admit it…the last few weeks have been mentally challenging. In the past, every time I would pull up to the house and lock the car…a distinctive beep would sound as the alarm was set. This would usually signal the dogs inside that I was home…and they would start barking in unison…in anticipation. Belle still does…but now it always makes me think of who’s missing. I’ve had this nagging voice in my head lately…”Get thee to a mountain!” So…I listened…and set off early this morning for Caesars Head State Park, in the Southern Appalachians in upstate South Carolina. A three hour drive to the Blue Ridge Escarpment, where the mountains meet the Piedmont. I set off in silence…with only an occasional comment from Molly (my Garmin GPS). It was about an hour down the road, when my mind started to settle down. I imagined all of the incessant thoughts and concerns just flaking off in the wind…left behind in my wake as I looked in the rear-view mirror. The mountains were starting to exert their calming influence…their ancient stability. At one point though…Molly suddenly spoke up…seemingly flustered at something. Glancing at the GPS…I noticed that we were in the middle of some vast, white, featureless plain, with no roads in sight. Molly seemed quite frantic as she tried to get her bearings…and we finally drifted back onto the road we had been travelling. I wrote it off to sunspots, or a solar flare…interfering with Molly’s advisers up high in Earth orbit. But then I thought of Molly’s previous life…and hoped old bad habits weren’t reappearing. 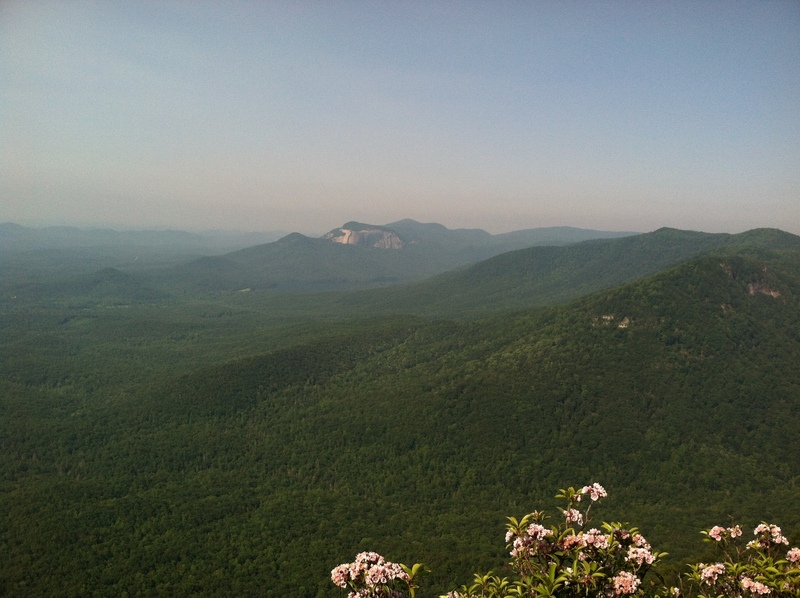 I did make it safely up to Caesars Head…and the view from the overlook at the top was spectacular…with Table Rock off in the distance, and a lush green forest far below. After checking in at the visitor’s center to get directions to the Raven Cliff Falls trail, I drove down the road to the trail head and parked the car. My plan was to view these falls, which have a height of about 420 feet, and which are one of the highest waterfalls in the East. I casually donned my day pack, in which I had packed a light lunch…monk’s fare of one hard-boiled egg, and some cheese and hummus on rye bread, and I set off down the trail. I found the first mile a bit strenuous…until I came to a fork in the trail…and discovered I was on the wrong trail. So much for my hiking skills. I made my way back to the parking lot…a bit red-faced (thankfully I didn’t have to explain myself to anybody). Back at the trail head…I set off in earnest down the proper path, being sure to make careful note of the red blazes on the occasional tree that marked the Raven Cliff Falls trail. It was 2.2 miles to the falls overlook…going down…and then going up…huffing and puffing along the way. It seemed never-ending at times…but I pressed on. 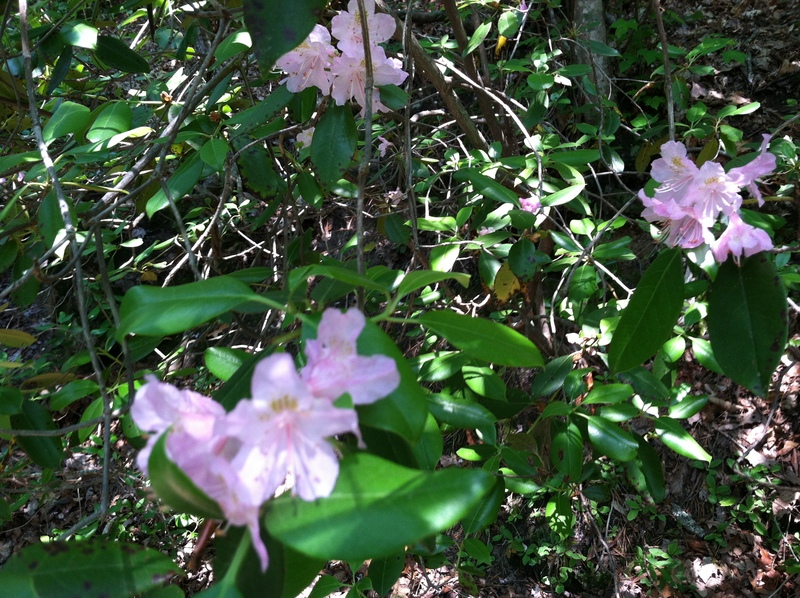 I was rewarded along the way…seeing Pinkshell Azaleas in bloom (they actually belong to the Rhododendron family…Rhododendron vaseyi). They’re a species endemic to a small area just across the border in North Carolina, but they seem to have made their way into South Carolina as well. 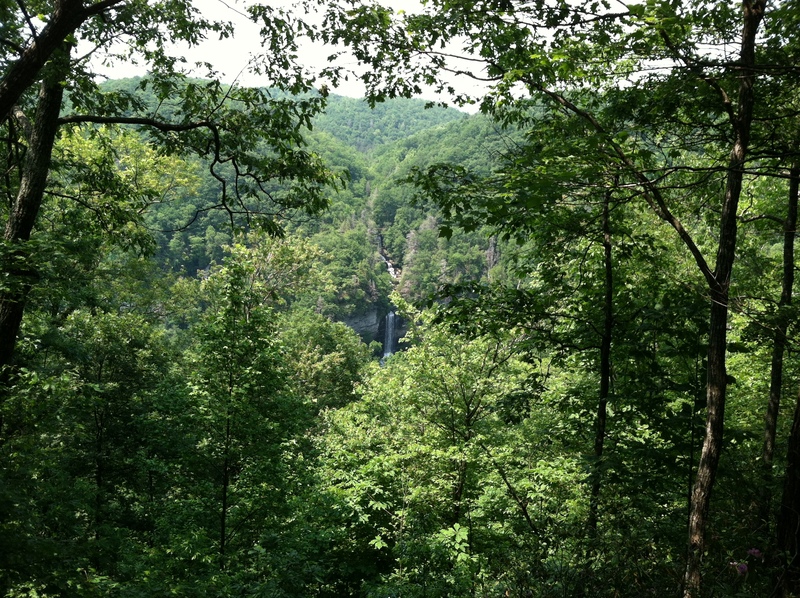 After much trial and tribulation (for me anyway)…I finally made it to the overlook, and got a glimpse of the falls. They were still about a quarter-mile or more away, but still impressive. My picture doesn’t do the falls justice…but they’re in there somewhere. To actually get to the falls, one has to descend the Dismal Trail (didn’t like the sound of that) a further 1200 feet (which means ascending 1200 feet on the way back). Maybe next time…or perhaps in another life. I did manage to do about 400 feet of elevation, and about 6.5 miles (including my 2 mile mistake)…and I’m quite proud of that…even though my body feels somewhat broken at the moment…and I can’t wait to fall into bed.